It is our aim to make Pinewoods Holiday Park the best holiday park in North Norfolk, a destination to which our customers wish to return to year after year (over 80% of our bookings are repeat customers). We have specifically not developed large clubhouses with entertainment or noisy swimming pools. Rather we have created a peaceful, green environment where our guest can take advantage of quiet enjoyment of their surrounding area. In our recently developed generous holiday pitches, thousands of shrubs, flowers, trees and hedges have been planted. These attract wildlife such as birds and butterflies, which add to the rural setting. This green setting, together with energy saving initiatives we have instituted to save water and electricity as well as harmonising solar power to heat showers, have earned us David Bellamy Gold Award consistently since the year 2000. In 2002 the Park was upgraded by the English Tourist Board to a 4 Tick resort. This part of the Norfolk Coast is designated an ''Area of Outstanding Beauty''. It is surrounded on four sides by the increasingly important Holkham National Nature Reserve, a haven for breeding, wintering and migratory bird life. 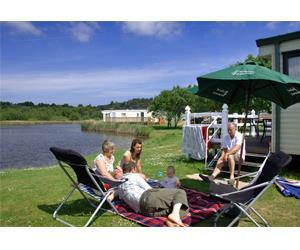 The vast majority of static holiday homes are privately owned and we do sell customers new and second hand caravans. An annual ground rent is then payable by these owners. We have a small fleet of luxury holiday homes for rental by the week, or for short breaks (short breaks are not available in July or August). This fleet has recently been joined by three and four bedroom wood lodges in prime positions overlooking the lake or the pinewoods. Holidaymakers may bring their own touring caravans and we have a choice of standard electric pitches or our new and generous pitches with hard standing. Many of our static holiday home owners started holidaying in their youth at Pinewoods in tents before graduating up through touring caravans to holiday homes, so we continue to cater for campers ranging from those who want electricity on a standard pitch to those preferring to camp closer to nature either on our wild flower meadow, or next to Abraham's Bosom, our lake. Other facilities at Pinewoods include a well stocked and recently enlarged shop and quality cafe, both of which are open late on Friday and Saturday nights during peak summer periods, for late arrivals. There is a play area, launderette and a miniature railway that connects us to Wells-next-the-Sea one mile away, boating on the lake, trampolines, crazy golf and a Pitch & Putt course. And of course there is Wells and Holkham beach, seven miles of golden sand and the location of the closing scene in the film ''Shakespeare in Love''. We hope you come and stay at Pinewoods and enjoy the beauty and tranquillity of the area, we are confident you won't be disappointed. Facilities for children: Cots available, Highchairs available, Outdoor play area Children welcome from any age. A11 to Barton Mills roundabout, then A1065 through Brandon & Swaffham to Fakenham. Take A148 to Cromer, after 500m turn left to Wells-next-the-Sea (B1055). After 10 miles arrive at Wells. A149 proceed to Wells Quay. We are 1 mile north of harbour. From King's Lynn or Cromer stations take the Green Line "Coast Hopper" bus which drops off next to Quay in Wells. From Quay the beach & holiday park are well signed. Can take the small Wells Harbour Steam Railway to park.